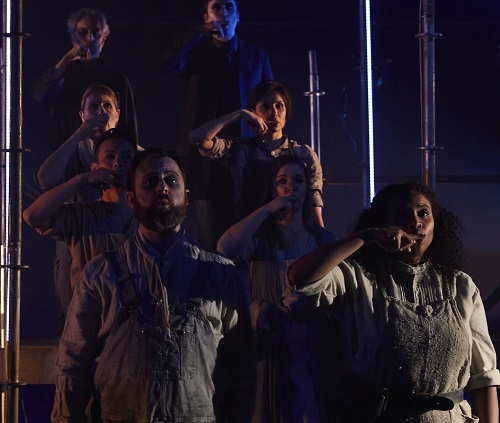 Against the Grain Theatre‘s production of Kopernikus: A Ritual Opera for the Dead by late Montreal composer Claude Vivier is unlike anything I have seen at the opera to date. This unique piece blurs the lines between dance, opera and theatre and pushes the boundaries of our understanding of operatic singing. In the composer’s own words “there is no story” and the experience is much more akin to a musical meditation than watching a show. Given that much of the libretto is in a language entirely of the composer’s invention, the performance is perceived more so than understood. The central figure, Agni, has recently crossed over to the other side and must find her way in the underworld, receiving guidance and insight along the way from historical and literary figures such as Tristan and Isolde, Kopernikus and his mother, Merlin, and Mozart. Through a progression of scenes that are much like the stations of a ritual, Agni ultimately achieves an incorporeal state of pure spirit. Claude Vivier’s life was tragically cut short by a vicious, opportunistic murder in 1983. He was 34 years old. He had a profound impact on the music world in Canada and Europe during his short life, becoming the youngest composer to receive the Governer General’s award for composer of the year in 1981. It is clear from this work, his only opera, that he was a master of creative innovation just getting into his stride. In this production, conceived of by artistic director Joel Ivany, the ritual unfolds on levels of raw wood and metal scaffolding. On this stark stage singers and chamber orchestra musicians in neutral tones mingle around the central figure, Agni, who stands out in striking orange. Through a seamless blend of monophonic and polyphonic textures, ritualistic gestures, and vocal and instrumental sound effects, the audience is drawn into an introspective, sacred space that is quite apart from the usual theatre-going experience. One of my favourite elements of the piece was the signers’ use of their hands in a manner that was paralleled by the trumpet player’s use of a mute. The singers used their hands to tap over their mouths during sustained pitches and used fingers to rub back and forth over pursed lips, creating ethereal warbles and trills, contributing the other-worldly effect of the experience. Vocally, the music transitioned very fluidly between chorus singing and short solo passages, making it challenging to describe any one person’s performance. The instrumental musicians were part of the stage, rather than in a pit. Dancers are also interwoven, and the entire company navigates the tiered space in manner that is much more accurately described as choreography rather than blocking. This requires the entire company to truly function as a single unit, and significantly expanded my understanding of the concept of “ensemble”. I left Theatre Passe Muraille with much more of a feeling than a thought, which is hard to sum up with words. See this for yourself while its on stage, it is certain to be the most unique presentation you experience in Toronto this spring. Show times are 8:00 PM on April 4, 5, 6, 11, 12 & 13 .